Q4 meetings were held in October and our ladies turned out in force. We added 19 new members as a result of our members spreading the word of our giving circle. Well done! We will end year three with over $225,000 donated to local charities since our inception in February 2015. We announced we are starting a new group in the East Valley! This group will serve women living in Chandler, Mesa, Gilbert and Queen Creek. We are teaming up with Leann Landberg and Trenna Farrell who will be the group’s leaders. We will host an informational meeting on Thursday, February 8th, at 6:30 pm. Our first donation meeting will be on April 19th. Our sponsored venue is The Forum on Gilbert Road, south of the 202 San Tan Freeway. 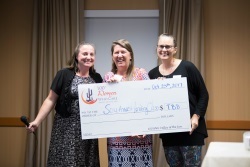 Teen Lifeline was the Q3 recipient of our Ahwatukee donations. 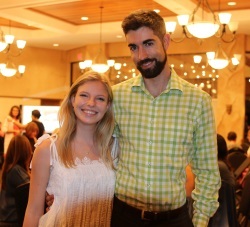 Nick Shivka, Donor Relations Coordinator, and MacKenzie, peer counselor, spoke to the group about the impact our $11,500 donation made on the organization. Teen Lifeline exists for one reason…to save lives. Our donation is helping them do that by supporting their school ID initiative. Thousands of teens will be able to have Teen Lifeline’s hotline number on the back of their student ID encouraging them to call Teen Lifeline whenever they want. Learn more here. Susan Kricun, Marketing Director of Ryan House, brought some very special guests with her to our Scottsdale meeting this quarter. Jolyn Andrews and her sons, Carter and Joel, enthusiastically shared how Ryan House makes a difference in their lives. According to Joel, Ryan House is a “wonderful, totally cool place” that he likes going to. Our members donated $9,150 to Ryan House in Q3. Listen to their story here. Leukemia & Lymphoma Society – Arizona Chapter – No parent wants to hear the words “your child has cancer.” Those words flip your world upside down and life immediately becomes different. 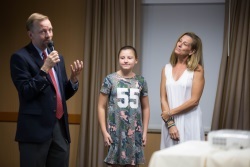 Margaret and Bella Hicks told their story to our West Valley group about how leukemia changed their lives and how LLS helped them along the way. Listen here. Being diagnosed with a blood cancer can be a financial challenge as well as a physical and emotional challenge. Even with health insurance, patients incur out-of-pocket expenses that can add up to large dollars. LLS provides financial assistance to patients to help with travel, medication and other expenses. During the last fiscal year, LLS Arizona provided nearly $2M to Arizona patients. Our West Valley members donated $2,020 to LLS in Q3. Learn more here. 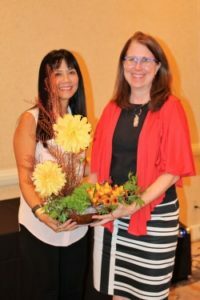 Girls Scouts – Arizona Cactus Pine Council – Staci Charles described how this organization builds girls of courage, confidence and character and who will make the world a better place. Their programs empower girls to Discover themselves, Connect with others, and Take Action in their communities. The Girl Scout experience is girl-led and encourages cooperative learning and learning by doing. Everything girls do in Girl Scouting is designed to help them grow into well-rounded adults equipped to successfully meet the future. Justa Center – Debbie Smith shared how this charity’s mission is to move homeless seniors over 55 years old into safe, affordable housing and to ensure they are successful in their placement. They believe every senior deserves a place to call home. While these seniors are on the street, Justa Center provides a day resource center that provides nutrition assistance and meals; basic physical healthcare; mental health counselling; personal development; job assessment training/placement assistance; access to showers and laundry; lockers to store personal belongings; and mail service to receive personal benefits. Girls On The Run Serving Maricopa County – Cindy Brown nominated this charity who inspires girls to be joyful, healthy and confident using a fun, experience-based curriculum which creatively integrates running. 1,400 3rd – 8th grade girls participated in their programs in 2016. Phoenix Boys Choir – Mary Hall explained how the Phoenix Boys Choir, through educating boys in the art of singing and performing the finest music in the boy choir tradition, develops character, discipline, leadership, global awareness and a strong commitment to excellence, thereby contributing to the greater Phoenix musical life and enriching Arizona’s cultural reputation nationally and internationally. The PBC has been changing lives through music for over seventy years. 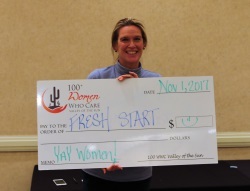 Fresh Start Women’s Foundation – Hayley Weiss described how this charity is committed to empowering women to transform their lives through education and engagement. Programs and services focus on three core values: economic self-sufficiency, education and personal development. Oakwood Creative Care – Pamela McConlogue nominated this charity and explained how they enhance the mind, body, and spirit of adults with cognitive and physical impairments as well as their family care partners. They offer Day Clubs (known through the industry as an adult care center) specializing in treatment beyond the traditional care model. Their INNOVATIVE research based programs are revolutionizing how care is delivered. They believe a diagnosis does not define your life and there is treatment beyond a pill. 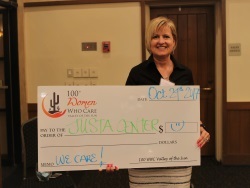 100 Club of Arizona – Kellie Meza shares how this charity provides immediate financial assistance to the surviving families of public safety officers and firefighters killed or seriously injured in the line of duty. They also provide other forms of assistance which improve the safety and welfare of public safety officers, firefighters and their families. Southwest Lending Closet– Ann DeVlaeminck introduced the group to this charity that lends durable medical equipment to anyone in need, free of charge. The Closet is the only service of its kind in the state of Arizona. Make-A-Wish Arizona – Crissie Jameson is passionate about Make-A-Wish Arizona who grants the wishes of Arizona children, age 2.5 – 18 years, who have been diagnosed with a progressive, degenerative or malignant condition that has placed the child’s life in jeopardy. Last year, Make-A-Wish Arizona granted a record 365 wishes. 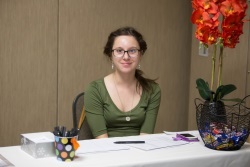 Aside from funding, they are in need of more volunteers to help wishes come true for families. God’s Garden Treasures provides beautiful flowers for our raffle each quarter. Karin Crawford, Owner, has a unique and creative approach we all love. 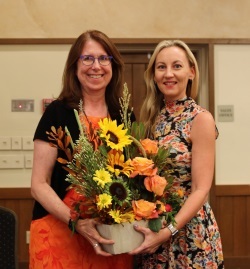 She brought beautiful fall bouquets for two of our lucky members, Sunnev Terrell and Suzanne Parks. Please think of God’s Garden Treasures when ordering your holiday flowers this year. 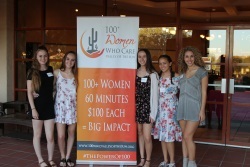 The Ahwatukee Foothills News published an article about our donation to Teen Lifeline. Read it here. 2018 dates and locations for all groups have been announced! Register on our Meetings page. 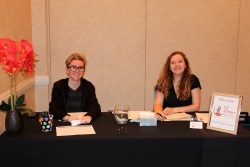 THANK YOU to our teen volunteers from Desert Vista HS, Horizon HS, Pinnacle HS and Trivium Prep! You are appreciated! Year three is complete! Enjoy the holidays and we’ll see you in 2018!